Share the post "GUN INFO 101 — Headspace Defined and Illustrated"
However, if you ask a typical reloader for the rotational rate of his bullet, in revolutions per minute (RPM), chances are he can’t give you an answer. Knowing the true spin rate or RPM of your bullets is very important. 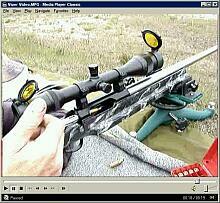 First, spin rate, or RPM, will dramatically affect the performance of a bullet on a game animal. Ask any varminter and he’ll tell you that ultra-high RPM produces more dramatic hits with more “varmint hang time”. Second, RPM is important for bullet integrity. If you spin your bullets too fast, this heats up the jackets and also increases the centrifugal force acting on the jacket, pulling it outward. The combination of heat, friction, and centrifugal force can cause jacket failure and bullet “blow-ups” if you spin your bullets too fast. Additionally, bullet RPM is very important for accuracy. Nearly all modern rifles use spin-stablized bullets. The barrel’s rifling imparts spin to the bullet as it passes through the bore. This rotation stabilizes the bullet in flight. Different bullets need different spin rates to perform optimally. Generally speaking, among bullets of the same caliber, longer bullets need more RPM to stabilize than do shorter bullets–often a lot more RPM. On the other hand, Research by Bryan Litz of Applied Ballistics has shown that with long, boat-tailed bullets, best accuracy may be achieved with twist rates slightly “faster” than the minimum required for stabilization. The reasons for this are somewhat complex — but it’s something to consider when you buy your next barrel. If, for example, the bullet-maker recommends a 1:8.25″ twist, you might want to get a true 1:8″-twist barrel. Share the post "How to Calculate Bullet RPM — Spin Rates and Stability"
To learn more about stub gauges, read this AccurateShooter Forum Thread. Forum member Lawrence H. has stub gauges made with his chamber reamers for each new barrel He has his smith cut a port in the stub steel so Lawrence can actually see how the bullet engages the rifling in a newly-cut chamber. With this “view port”, one can also see how the case-neck fits in the chamber. Lawrence tells us: “My stub gauges are made from my barrels and cut with my chamber reamers. With them I can measure where my bullets are ‘touching the lands’ and shoulder bump dimensions. This is a very simple tool that provides accurate information.” The photos in this article show the stub gauges made for Lawrence by his gunsmith. Share the post "Stub Gauges — Cool Tools That Perform Important Functions"
A couple seasons back we published our comprehensive 6.5×47 Lapua Cartridge Guide, researched by the 6.5 Guys. In case you’ve been wondering what kind of accuracy is possible for a tactical-type rifle chambered for this mid-sized cartridge, check out this tack-driver built by gunsmith Ryan Pierce. That’s a mighty impressive 0.206″ five-shot group fired with Berger 140gr Hybrids using a Brux cut-rifled barrel. The powder was Hodgdon H4350, a very good choice for this cartridge. Share the post "6.5×47 Tactical Tack-Driver — The Non-Creedmoor ‘Six-Five’"
Some folks think of laminated stocks as modestly-priced, “low-tech” alternatives for varmint and hunting rifles. In fact, for shooting disciplines that do not demand ultra-light weight, good laminated stocks give up nothing in performance to the most sophisticated composite stocks. And with laminates, it is relatively easy to fine-tune fit and ergonomics to suit the individual shooter. Available in a wide choice of colors, laminated stocks can also be very handsome. In our Shooters’ Forum, you’ll find a thread showcasing laminated stocks. It’s worth viewing. There are many interesting designs, and a wide variety of rifles ranging from “walking varminters” to long-range prone rifles. Share the post "Laminated Wood Stocks — Gallery of Guns"
The cut-rifling process, used by leading barrel-makers such as Bartlein, Border, Brux, Krieger, and Obermeyer, can yield a very high-quality barrel with a long useful life. Cut-rifled barrels have been at the top in short- and long-range benchrest competition in recent years, and cut-rifled barrels have long been popular with F-Class and High Power shooters. Video find by Boyd Allen. Archive photos from Border-Barrels.com. In June 2013, Birmingham Gunmakers Ltd. acquired Border Barrels. Dr. Geoffrey Kolbe has set up a new company called BBT Ltd. which produces chamber reamers and other gunsmithing tools and gauges. (Thanks to L. Holland for the Kolbe update). Share the post "The Cut-Rifling Process — A Short History and Demonstration"
Share the post "The Art of Gun-Making — Remarkable Video from Beretta"